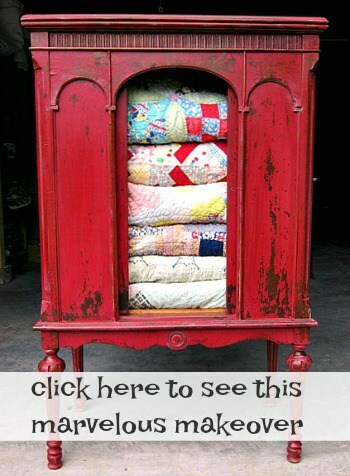 Do you want to know how to make new furniture look old? The process I use to antique painted furniture is really easy. There are 5 steps and I’ll walk you through them. This is the piece I started on Monday and finished up yesterday. It could actually be completed in one day if you don’t have a ton of errands to run or anything like that. 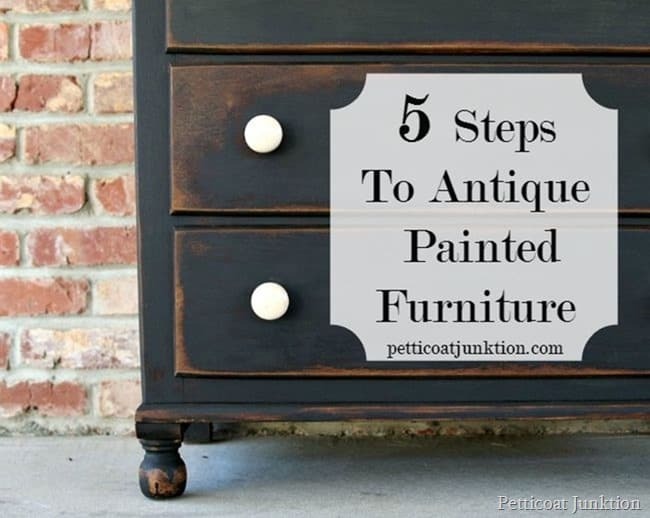 Trust me when I say that the 5 steps to antique painted furniture are easy, really easy. The whole process can be completed in a day or two depending on the type of paint used. I’m going to list the 5 steps then go into detail with a photo tutorial. 1. Select the proper paint. 5. Finish with a dark wax. Step 1. Select the proper paint. When I say the proper paint I’m really referring to the paint finish. 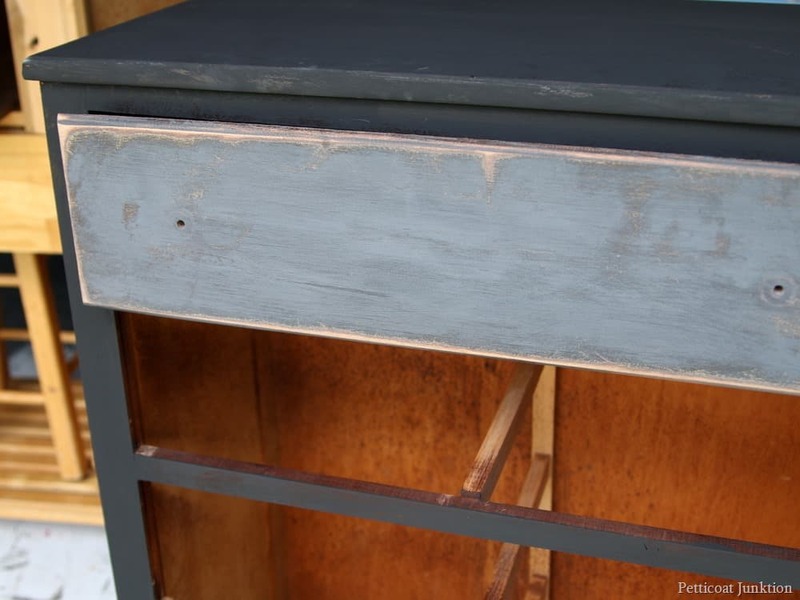 A flat or matte finish works best for the antiquing process. Satin or eggshell can also be used with slightly different results. The paint brand or type doesn’t matter so much. 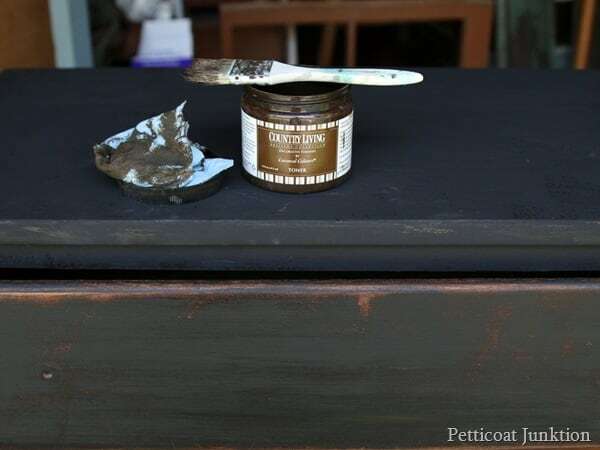 I’ve used Caromal Colours Textured Paint, Reclaim Beyond Paint, Behr latex flat paint, and Miss Mustard Seed’s Milk Paint on the pieces I’ve antiqued. I wouldn’t suggest using chalk paint because it really grabs onto the antiquing products and the look is too dark. The Reclaim paint does have a slight sheen and it looks great antiqued but I do prefer the flatter look of the other paints. I’m definitely not saying these are the only paint choices to achieve the antiqued look. These are the ones I’ve used. 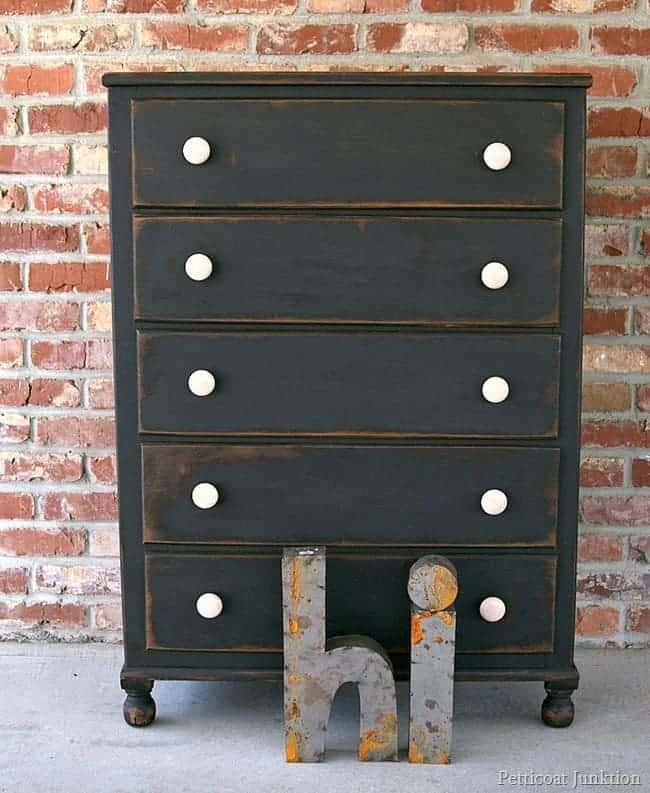 I haven’t tried the process on chalk paint so not sure if that works with this process. This is the piece before painting. 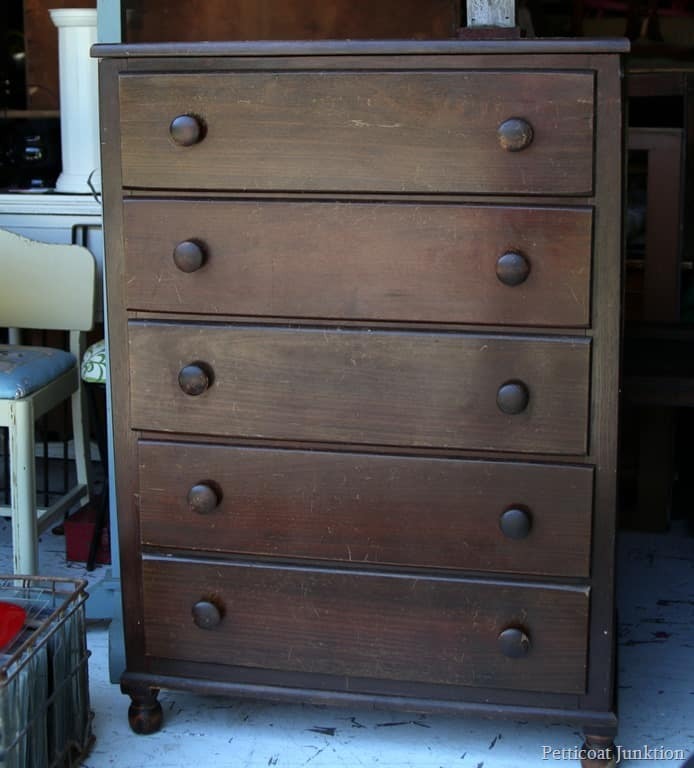 I got this chest at ….you guessed it……My Favorite Junk Shop. I think I paid $40 for it and we only had to do a few minor repairs. I used the Caromal Colours Paint for this project. 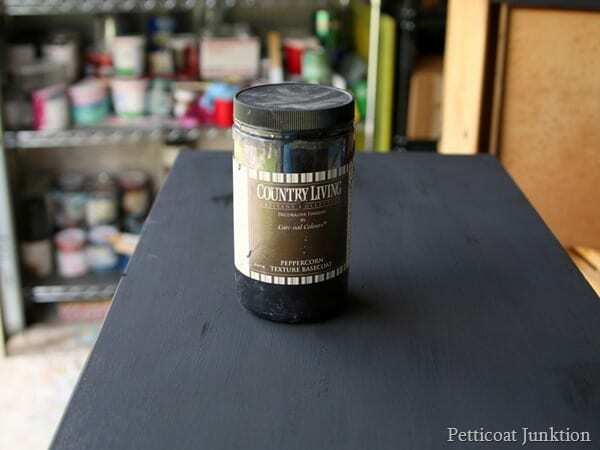 It is trademarked by Country Living and the color is peppercorn. I love this paint. It’s really thick and you can spread it on thin or mush it on for a textured country look. The paint is made to stick to anything. It’s great for painting cabinets. I applied one coat of paint on the chest. 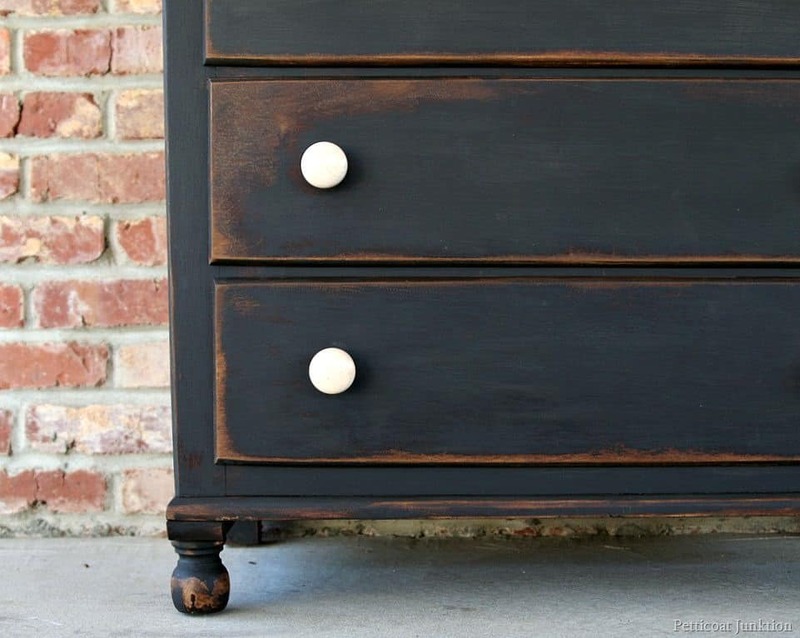 When distressing a piece heavily I don’t worry about covering every little bit of furniture with the paint. Why waste paint….I’m taking a lot of it off later! Step 3. Distress the paint. I know this looks scary. 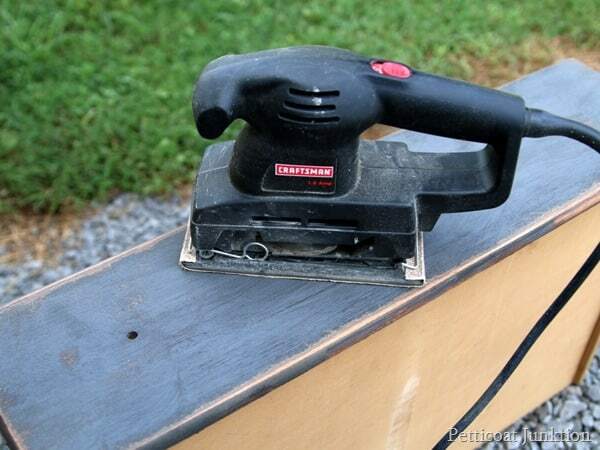 I use 60 or 80 grit sandpaper and distress the whole piece with an electric sander. The gray/white crazed looking part will go away…trust me. One drawer after distressing. Yep, it looks rough but it’ll be okay. I use an inexpensive chip brush. In the photo above the toner has been applied to the drawer front only. I apply the toner all over then wipe it off with a dry cloth. The dry cloth leaves a lot of the toner behind. To remove most of the toner I use a damp rag. On black or dark paint it really doesn’t make a lot of difference. On white paint the toner shows up a lot so a damp rag works best. I have a complete tutorial on the toner here. Wait until the toner is completely dry before moving on to step 5. Step 5. Apply a dark wax. Once the toner is dry I apply a coat of Howard’s Wax in Golden Oak using a lint free cloth. Old sheets are perfect! The wax dries in about 15 minutes then I buff it with a dry lint free rag. 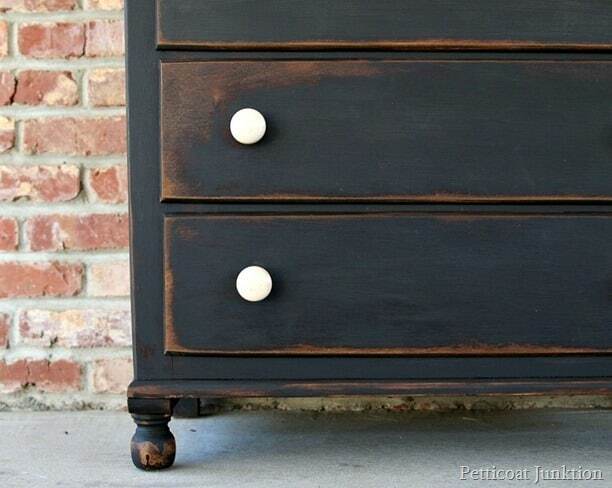 Vintage Dresser with a two-tone toner application. 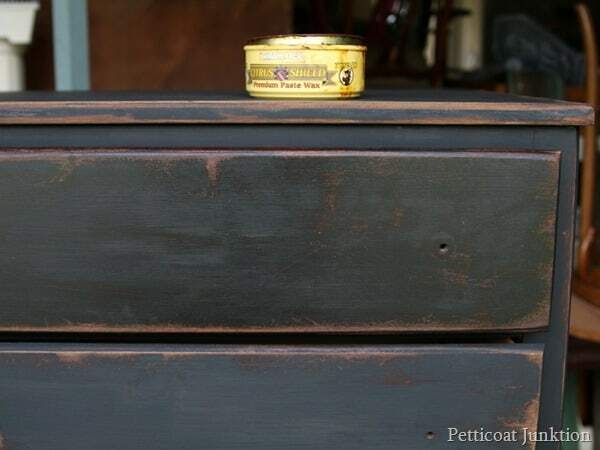 Pair of Nightstands Painted Silver Metallic and Aged with toner. Find Howard’s Wax here , Caromal Colours Toner here, and my favorite DIY Products here. Thanks for the post! Love the finished dresser, so beautiful. wondering, Is there any prep to the furniture needed with the Country Living paint? You stuff is so delightful…I wish I lived closer…. what is toner? is it like a glaze I don’t think I have seen toner in a paint store – although I haven’t really looked. 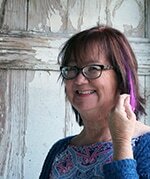 Good Morning Kathy~ Thank you for sharing the tutorial. Dark paint has intimidated me. You make it look quite simple. Your other projects are always spot on. Have a Beauty-full day.